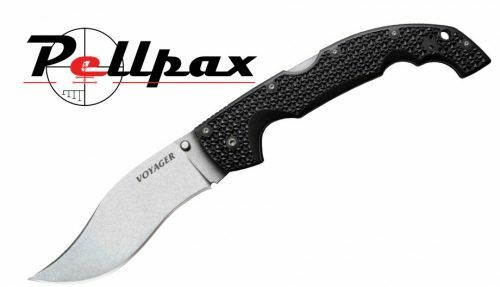 Home » Blades » Knives » Folding Knives » Cold Steel Voyager Vaquero 5 1/2"
Sharp, strong, reliable and powerful, the Vaquero Extra Large from cold steel is made for anyone. Fitted with a Stainless steel pocket/belt clip so you can take your powerful tool anywhere you go. The Griv-Ex handle measuring 6 3/4" offers a powerful, comfortable grip. Griv-Ex is designed to give you grip even in the toughest conditions so you have access to your tool when you need it the most. The finger grooves allow you to be comfortable yet in control when using this knife. They also act as a safety feature keep your fingers away from the blade and therefore reducing the chance of injury. With a unique shape to help it fit any-ones hand, the handle of the Vaquero is the best design both ergonomically and aesthetically. The blade of the Vaquero is where this knife stands out. The 5 1/2" Japanese 8A Stainless steel blade is lightweight and reliable. 8A has a carbon content of 0.75% and is often used instead of 440C stainless steel.It is considered as one of the high end stainless steels which are very resistant to corrosion making it ideal for knife blades. The serrated cutting edge allows you to cut/saw though tough materials with ease. The Clip point blade makes it great at piercing materials without needing a great amount of physical effort. To create a professional look for this already amazing blade it has been stone washed. This gives it the grey effect and really helps to finish the blade of. Cold Steel Voyager Vaquero 5 1/2"
Add this item to your basket & spend an extra £390.01 to apply for finance.